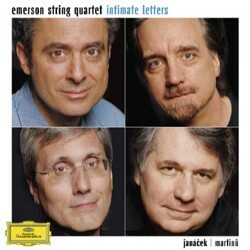 The world-renowned and unparalleled Emerson String Quartet, which has already produced over thirty award-winning albums, applies its unmistakable intensity and energy to its latest release, Intimate Letters, an exploration of the personally expressive works of two great Czech composers: Leoš Janácek's String Quartet No. 1 "after Leo Tolstoy: The Kreutzer Sonata"; String Quartet No. 2 "Intimate Letters"; and Bohuslav Martinu's Three Madrigals for Violin and Viola. Released by Deutsche Grammophon, Intimate Letters is now available for purchase and download-along with a special bonus track.